The SM Gift Pass is accepted at the following stores: The SM Store, SM Supermarket, SM Hypermart, SaveMore, SM Appliance Center, Ace Hardware, Ace Builders Center, Baby & Co., Kultura Filipino, Our Home, SM Cinema, SM Bowling, SM Ice Skating Rink, SM Storyland, Sports Central, Surplus Shop, Toy Kingdom, Watsons, IMAX Theatre, Forever 21, Exploreum, Radisson Blu, Pet Express, Snack Time, Uniqlo, Levi’s, Walter Mart Supermarket, Alfamart, Crate & Barrel, Joseph, Sfera, The Body Shop, Skyranch, Bata, Crocs, MindPro Supermarket, Miniso, Simply Shoes, SM Science Discovery Center and SM Foodcourt (selected outlets). Each eGift code is unique with a corresponding SM Gift Pass amount. The recipient is responsible for safekeeping the eGift code. The eGift code must be presented to the Bills Payment Counter for validation. Once validated, the Bills Payment Officer will release the SM Gift Pass. 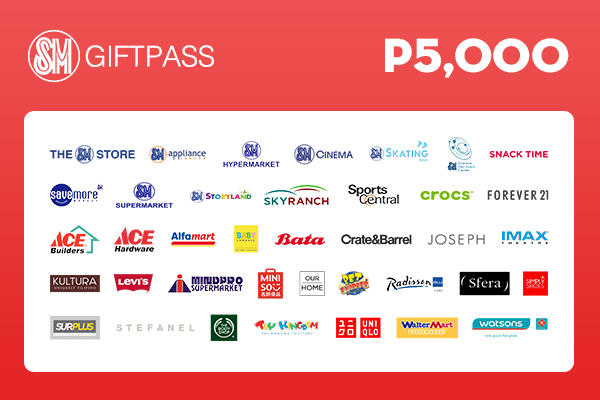 SM Gift Pass vouchers can be used at the following stores: The SM Store, SM Supermarket, SM Hypermart, SaveMore, SM Appliance Center, Ace Hardware, Ace Builders Center, Baby & Co., Kultura Filipino, Our Home, SM Cinema, SM Bowling, SM Ice Skating Rink, SM Storyland, Sports Central, Surplus Shop, Toy Kingdom, Watsons, IMAX Theatre, Forever 21, Exploreum, Radisson Blu, Pet Express, Snack Time, Uniqlo, Levi’s, Walter Mart Supermarket, Alfamart, Crate & Barrel, Joseph, Sfera, The Body Shop, Skyranch, Bata, Crocs, MindPro Supermarket, Miniso, Simply Shoes, SM Science Discovery Center and SM Foodcourt (selected outlets). The eGift code cannot be reused once redeemed. The eGift code cannot be exchanged for cash. Processing of transactions will be based on the availability of the validation system.